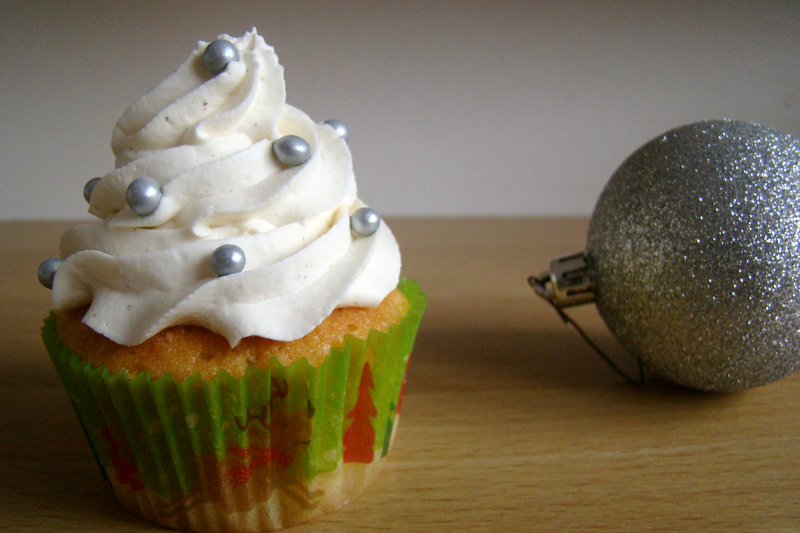 The full title actually is: Vanilla Christmas Tree Cupcakes with fluffy Cinnamon Cream Cheese Frosting. Try saying that five times in a row! I know Christmas is already behind us, sadly. But I still wanted to share my Christmas Trees with you! 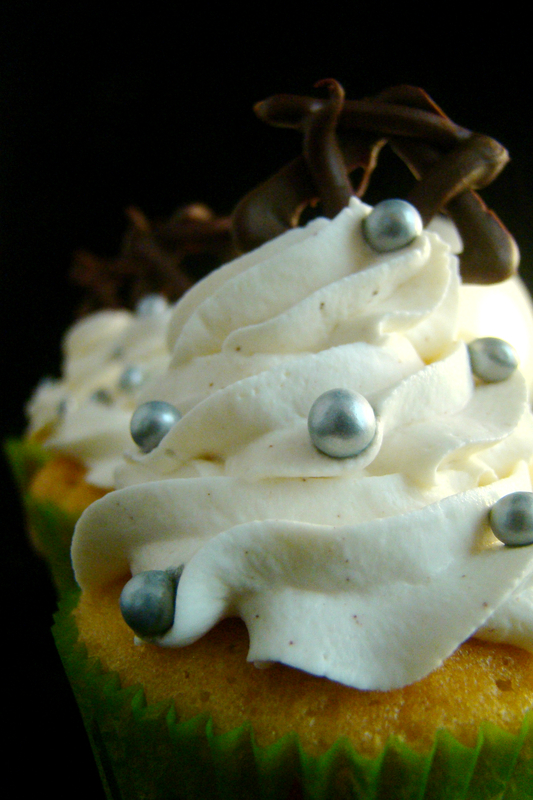 This frosting is the fluffiest, most delicious and subtle frosting I’ve ever had or made! The cupcakes are my Vanilla Cupcakes. Let’s make that nice and fluffy frosting! Whip up the cream and set aside in the fridge. Whip up the cream cheese and the powder sugar. Add the whipped cream to the cream cheese. Add the dashes of cinnamon and blend it all in. Fill your piping bag and FROST! Let’s move on to the making of our Christmas Trees! Melt the chocolate in the microwave or au bain marie. If you use the microwave, use sessions of 30 seconds and stir everytime before starting another session. Fill your piping bag with the melted chocolate. Cut off the tip of the bag. Put some baking paper on your plate. Take your piping bag and start making starshaped figures on the baking paper. Take your frosted cupcakes and the sugar balls. 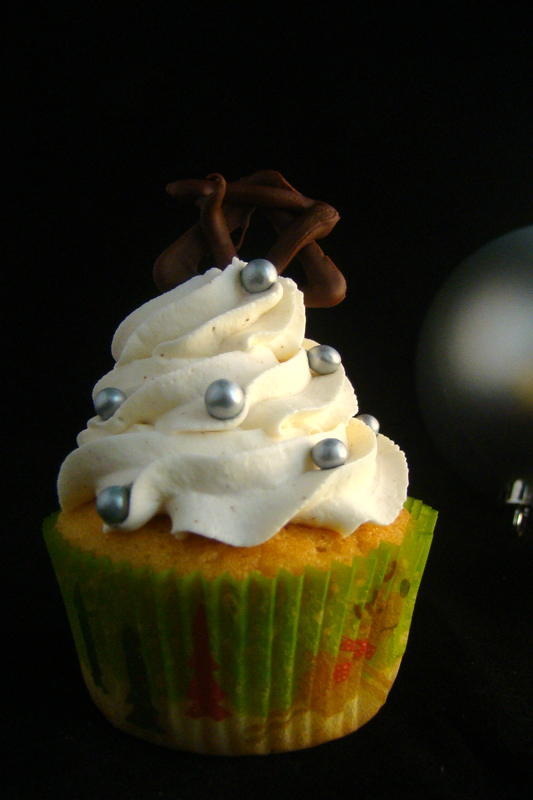 If your chocolate stars are cooled and hard, you can put them on top of the Christmas Tree Cupcakes! Gorgeous and torturous clicks 😉 amazing !! Happy 2015 ! Your cupcakes look beautiful! The frosting is just perfect. amazing cakes! Love frosting that’s made with cream instead of butter, it tastes so much nicer than a standard buttercream! Such a beauty Sarah! Amazing click and a good recipe. Happy new year and FF! And Happy New Year too of course! Your pipping technique looks professional to me! Happy FF! Awwww thank you so much, Johanne! Happy FF! Thank you! Glad you like them 🙂 Happy FF! Haha yes that’s true! 😀 hugs! You could call these your mirror ball cupcakes and then say they are for the new year! They look so delicious! Haha that’s a great idea! :p Happy New Year! So festive and beautiful. Happy New Year! Thank you! 😀 Happy New Year! Happy New Year, and happy FF! Lovely cupcakes, I could seriously eat those photos! Great looking cakes! Happy FF! Beautiful cupcake Sarah, they look wonderful and I know they are delicious. Happy New Year.